Bring a large pot of salted water to a boil. Carefully drop in the diced potatoes and cook until a fork or pairing knife slides in easily, but the potatoes are still holding their shape, about 12 minutes. Remove with a slotted spoon or spider and place in a large bowl. Drop in the diced carrots and cook for just one minute, remove and set aside in a smaller bowl. Finally drop in the peas and cook for one minute, then remove and place in the bowl with carrots. Melt the butter in a small skillet over medium heat. Once it sizzles, add the onion and cook until wilted, stirring occasionally, about 3 to 4 minutes. Remove from the heat. Add the cooked onions, mustard, cream, egg, salt and pepper to the bowl with the potatoes, and gently mix and mash until well incorporated. Add the peas, carrots, olives and pickled jalapeños and mix well. Scrape into a 9” x 11” baking dish or into small individual ramekins. Bake for 20 to 25 minutes, until the top has slightly browned. Serve or keep warm. Made this twice and each time served it with Axis Chops. Wonderful ! So easy to prepare and can be reheated. It gives the dish a festive look. I agree the olives add a interesting flavor you don’t expect. Will be trying more of Pati recipes. Yay! I hope you enjoy many more recipes, Juju. If you love potatoes, you will love this. The added flavors all extend and compliment the potato flavor. 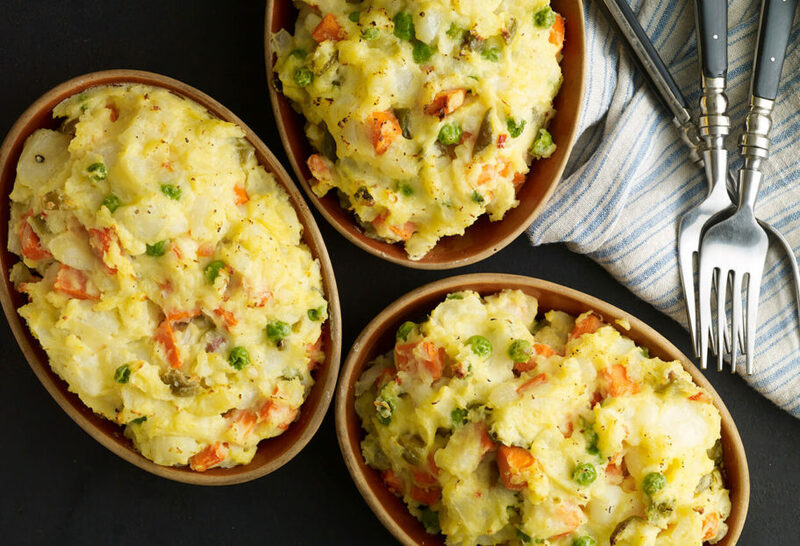 The carrots and peas turn the dish into more than mere mashed potatoes. The jalapenos and olives give a little surprising burst of flavor. And do try to get the Mexican crema instead of sour cream. It has a special flavor all its own. My family could not stop eating this at dinner. Pati has become our “cooking angel.” Thank you Pati! Thank YOU Guadlalupe! I’m so happy the whole family loves the recipes! Hi Pati, I made this for my wife and mom while they were out Christmas shopping. To make a long story short, they ate 1/2 the 11×9 pan for lunch and had more as the side for dinner. I included some corn just for a touch of sweetness when I cooked the peas. That’s two recipes I’ve made from this site in two days (Oaxacan Chicken) with the ingredients for a third already on hand! Keep the flavor coming! I’m so happy to hear this, Mark! Thank you! Pati, in the past, I’ve always made mashed potatoes by boiling the potatoes with the skin on, whole. I cut a ring around the potato before boiling so the skin is easier to remove. Do you still prefer to boil the potatoes peeled and diced? Thank you kindly and I am excited to make this for Thanksgiving. Do you have a vegan substitute for the egg and Mexican crema? I was thinking avocado. Hi Sofie, I do! But you can also adapt the recipe to your liking. You can skip the egg and Mexican crema, and add what you use for vegan substitute to help bind the mixture together, as long as it is neutral tasting. It could be as simple as vegetable stock! How about the beaten egg? You add the egg to the cooked onions, mustard, cream, salt and pepper and all of that to the bowl with the potatoes. Then mix and mash it all until well incorporated. Then add the peas, carrots, olives and pickled jalapeños and mix well and put it into the baking dish. Can’t wait to try this recipe we saw last night – and the others too!! I hope you enjoy it Ailsa!